Before prospectors arrived in search of gold and silver, the area where Nelson now sits was home for thousands of years to the Ktunaxa and Sinixt First Nations, who fished once-abundant salmon. The Sinixt (pronounced sin-eye-kst) speak an Interior Salish language and are also known as the Arrow Lakes people. Although declared legally extinct in Canada in 1956, they continued to live on the Colville reservation in Washington state and have since returned to this area. The Ktunaxa (k-too-nah-ha) are also known as the Kootenay or Kootenai. Six bands of the Ktunaxa Nation live north and south of the border, including the Lower Kootenay, or Yaqan Nukiy, near Creston. Nelson’s modern era began in 1887 when a party from Colville discovered the Silver King mine on Toad Mountain and a townsite developed, named for BC Lt.-Gov. Hugh Nelson. 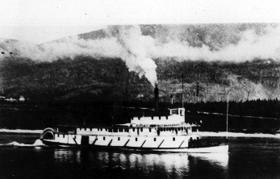 Within a few years, two railways reached the fledgling settlement, providing transportation for goods and ore, while a fleet of elegant sternwheelers connected points on Kootenay Lake. Many other mines, primarily silver, developed in the surrounding area. A four-and-a-half mile tramway was built to bring ore down from the Silver King mine to the Hall Mines smelter. 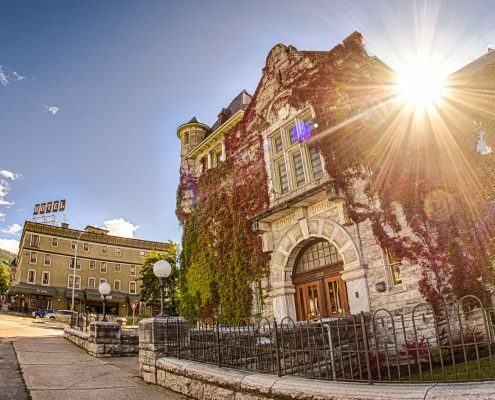 Nelson incorporated as a city in 1897 and became the administrative centre of the Kootenays. It boasted its own streetcar system and hydroelectric power plant — the first in BC — plus many impressive brick and stone buildings. In addition to English and American settlers, Nelson was home to sizable Chinese and Italian communities, as well as Doukhobors who immigrated from Russia to escape persecution. Fruit farming became a viable industry on Kootenay Lake at the turn of the 20th century, although many unsuspecting investors bought land sight unseen, only to discover it was much less suitable for agriculture than promised. Forestry eventually supplanted mining as the area’s major industry: Nelson was home to a large sawmill, a sash and door factory, a matchblock plant, and other operations. In the 1950s, Nelson also became a university town when the Roman Catholic diocese established Notre Dame, which later became David Thompson University Centre. However, the city fell upon hard times during the recession of the early 1980s, and both the school and the sawmill closed, while other major employers shed employees. Just as things looked dire, Nelson bounced back on the strength of its history: a downtown revitalization project uncovered and restored many hidden heritage buildings and Hollywood soon discovered the city’s charms. Today Nelson’s population is just over 10,000, while its trading area is twice that. It boasts a vibrant downtown, a thriving arts scene, and the cultural and recreational amenities of a much larger centre. Selkirk College has taken over the former university campus, where it offers music and tourism programs, while Kootenay Studio Arts continues a long tradition of arts education. Snow has been another salvation: Nelson is blessed with nearby Whitewater Ski Resort and Baldface Lodge, plus other cat and heli-ski operators. You can learn more about the city’s fascinating past by visiting Touchstones Nelson: Museum of Art and History, as well as the Nelson Sports Museum in the Civic Centre, the Chamber of Mines of Southeastern BC, and the fire hall museum. Self-guided walking and driving tours are also available. This circle tour will take you through the villages of Kaslo, New Denver, Silverton, and Slocan, all of whom owe their existence to mining rushes of the early 1890s. You’ll see sparkling lakes, boomtown architecture, and abandoned mines. Be sure to visit Sandon, a ghost town that was once the epicentre of mining in the area and still has a few vestiges of its heyday. From Sandon, you can also reach Idaho Peak, where a former forestry lookout offers an unrivaled view of the area. Ainsworth Hot Springs is the oldest community on Kootenay Lake. Originally a mining town, it’s now much better known for its resort and unique caves — tunnels blasted to increase the water’s flow. The resort also has a slightly cooler pool, cold plunge, hotel, and restaurant. Kaslo is home to two national historic sites: city hall, built in 1898, and the SS Moyie, a sternwheeler launched the same year that plied Kootenay Lake for 58 years before being retired and converted into a museum. The Kaslo Jazz Etc. festival is held each August long weekend on a floating stage in Kaslo Bay. The 35-minute voyage from Balfour to Kootenay Bay is often billed, accurately, as the longest free ferry ride in the world. The trip aboard either the MV Osprey 2000 or smaller MV Balfour must also rank as one of the most scenic ferry voyages. The East Shore communities of Crawford Bay, Gray Creek, Riondel are teeming with artisans and shops, and the delightfully eccentric Gray Creek Store, established in 1913, is one of the few places where you can buy a carton of milk and a wood stove at the same time. The International Selkirk Loop – dubbed North America’s only multi-national scenic loop – winds through two states, one province, and numerous interesting towns and villages. This 450 km excursion will take you through southeast BC, northeast Washington, and northern Idaho, including Nelson, Salmo, Creston, Newport, Bonners Ferry, Sandpoint, and Priest River. Plenty of recreational opportunities can be found along the way, including fishing, boating, hiking, biking, skiing, and horseback riding. Or take a self-guided walking tour.